Note: This post isn’t benefit auction-related. Sometimes I share other content. If you need auction help, search the blog for 500+ auction-related posts. Today I want to share information about a course and teacher I love. If you’re a small business owner, a nonprofit in need of a website, or an eternal student, read on. Back in 2009 I enrolled in an online course for non-techies called the Website Creation Workshop. I wanted to learn how to build my own website. I’d become so frustrated relying on someone else each time I wanted to upload a photo or blog post. It was time consuming to email my web gal when I wanted to change a word on a page. It took me more time to explain what I wanted my web master to do then what it would take for me to do myself. I paid $2000 to enroll, and it was one of the best investments I ever made in my business. In 8 weeks, I built and launched my Red Apple Auctions’ website on WordPress. The class was fun (yes! fun!) … educational … useful … enlightening … a confidence builder … and so much more. Christina, the teacher, made it so easy. To my friends, I described her as a kindergarten teacher. She simplified concepts and exuded such patience with even the slowest learners. 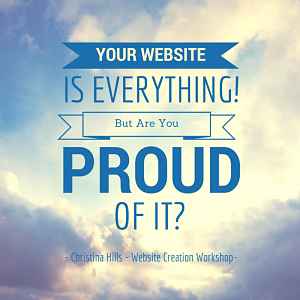 She made it easy for non-techies like me to learn how to create a wonderful website. To this day I employ knowledge I learned from her in 2009. Given how quickly technology changes, isn’t that remarkable? The reason I share this story is because the course runs once a year. It starts in late January and she is promoting it. This is her 9th year offering the program (I was in her 2nd year class) and I’ve heard the program is as good as it ever was. January 6, 2016 – Free educational webinar “The Simple Truth about Succeeding Online.” Learn about building an online business. This is probably best for business-owners. If you are an auction volunteer but run your own business for your day-job, consider participating in this. 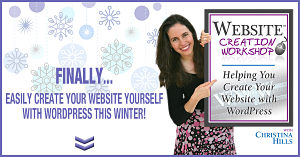 January 14, 2016 – Free educational webinar “Easily Create Websites Without Being a Web Designer.” Learn about the WordPress platform and her upcoming course. This would be good for nonprofits, business owners, or anyone wanting to build a website. Do you notice she has a deadline on enrollment? It’s because there is a lot of background work she and her team must do before the course launches. Students will be building their websites behind-the-scenes in a protected space, so she needs time to set up that area. When the course ends, students “open” their websites to the world. As detailed above, leading up to the January 14-21 enrollment period, Christina is offering two free webinars and some tools to introduce you to her, online learning, and the course. Consider taking advantage of these free webinars (listed above) to see if you like Christina’s teaching style. I’ll be sending some emails about her course. As I’ve no way of knowing which of my readers will be interested in Christina’s course, bear with me during those emails. If it’s not your “thing,” just delete the email and know that auction-related stuff will be forthcoming soon.